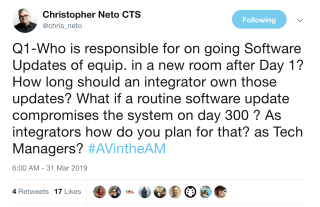 In the latest session of #AVintheAM—a popular Sunday morning Twitter chat—Chris Neto, #AVintheAM originator and social media expert, asked questions like "Who is responsible for on going Software Updates of equipment in a new room after Day 1?" and "How long should an integrator own those updates?" Here is a roundup of answers. I charge for risk and convenience. I encourage the end-user's IT admins to take care of software and updates. When I hear the pain in their voice, I say, "If it makes it easier, we can do it. I can just adjust the quote." Then, boom, SLA, and all are happy. "Our internal AV staff takes ownership of updates—firmware, etc.—but we rely on integrator partners to let us know they came out in case we miss it. Nothing makes us more angry than a room going down and finding out the cause/fix was an upgrade we didn’t know about!" All post-install support needs to have excellent communication. Firmware, hardware, maintaining as-builts, etc. rely on a good relationship. Sometimes you stay in your lane, other times, you get it done to support your customer and worry about the money later. Frequency aside, not having our own programmer, we leave that to the integrator as part of routine service. We've experienced the firmware-breaks-code issue before, and I'd rather have someone who's a little more up-to-speed on the code side there to address it. The integrator should be responsible for ongoing updates as we have the software and tools to do the update—and the the client does not. The integrator should own the maintenance of these software updates through an on-site or remote service and maintenance agreement. When I was an integrator, the commissioning of any complex system coming under a service contractor was commissioned hand-in-hand with the service department. This was primarily to breed familiarity between the client, system, and team managing the support . Regrettably, today's environment often reveals a zero-day vulnerability that you may have to patch in hours, not days. Our industry lacks a good integrator/service-provider model that can respond as quickly as needed. For more stories like these, read the full Twitter thread here. To join in the conversation, watch Neto's Twitter page on Sunday mornings for the weekly discussion topics and follow the #AVintheAM thread. Editor's Note: Some responses have been edited for style/length/clarity.